Justice Minister joins protest of Migron residents whose homes were destroyed 5 years ago, says PM's promises will be fulfilled this month. 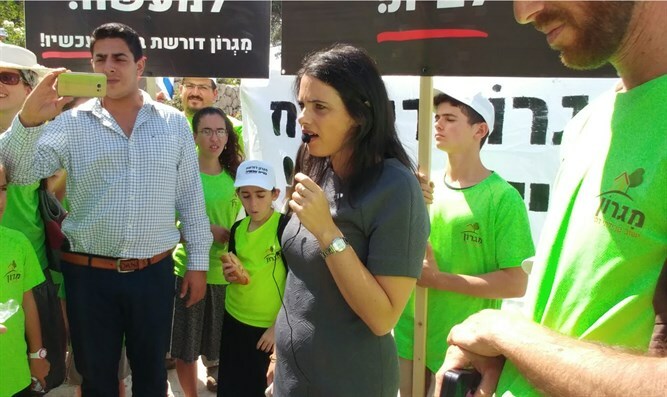 Justice Minister Ayelet Shaked arrived at a demonstration Sunday morning by the former residents of Migron to show her solidarity with the residents. Migron was destroyed at the order of the Supreme Court in 2012, and its residents have been without permanent housing for the last five years. "The Justice Ministry stepped in and resolved the legal issues facing Migron, and I am sure that the prime minister will stand by his word so that Beit El and Migron will be approved this September," Shaked told Arutz Sheva. Shaked addressed concerns that the prime minister's approval of construction for the residents of Migron and for the long-promised 300 housing units in Beit El would be postponed again following his visit to the UN General Assembly in New York this month. "The promise for Beit El is absolute. There is no need for discussion, only for the prime minister's approval. As Chairwoman of the Ministerial Committee for Legislation, I have heard that the marketing of the [housing units] in Beit El will be carried out in September, so we should wait until the end of September. I am sure that will happen." The minister also explained the steps the Justice Ministry and the government plan to take following the Supreme Court's decision banning the indefinite detention of illegal infiltrators who refuse to be voluntarily deported to a third country. "We need to understand the whole matter, The Supreme Court did approve two important things. One - it agreed that the third country is a safe country. And the second thing is that we can deport infiltrators to a third country without their consent. It therefore sought to amend the agreement with the third country. Today I have a meeting with the interior minister to examine alternatives. We are going to win this fight battle."